To date we have reached a total of $5,565 dollars in donations through GlobalGiving, however we still have a long way to go to reach our goal. That’s why we joined ‘Little by Little’ a campaign where the donations you make could be multiplied by GlobalGiving for the benefit of our cause. Our goal is to reach $ 2,000 dollars to have the chance to earn this benefit! And you can help us by donating since $10 USD. Donations of up to $50 USD will be matched, so your donation is amplified! You just have to enter our project and make your donation from Monday, April 8 (starting at 8:00 am) until Friday, April 12 (ending 11:59 pm). 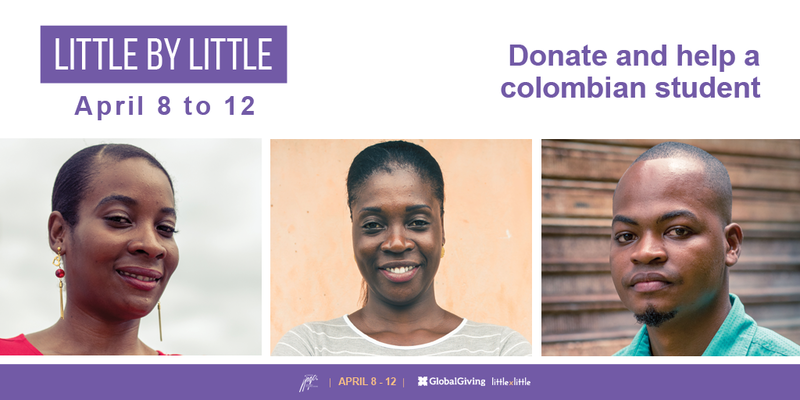 A week where we can change the lives of many young Colombians and their communities!